The "Raccoon" or RRVT, is the bike trail I most frequently ride. For me, the link between Waukee and Minburn is perfect for a fitness ride. The Raccoon River Valley trail is also a great trail for long rides. Trailside towns are less than 10 miles apart and provide good options for where to start/stop a ride or to take a break. The trail provides a variety of scenery ranging from open farmland to wooded areas flanking rivers and creeks. Riders 18 and up are required to a user fee of $2 a day or $10 for a year. Strong boxes are located at trailheads for purchasing trail permits. This was a fitness ride from Waukee to Minburn. A ride with some fast intervals and a couple of burnt calories. Arriving in Minburn I stopped to take a quick photo of the work on the train depot. Things are coming along very nicely! According to a local resident, they are crossing their fingers it will be open on May 16th. The cafe is scheduled to open the following week. Pedaling through town, two previously unnoticed points of interest caught my eye. The first was a metal container outside the American Legion used to dispose old American flags. I didn't look inside to see if there were any in there. Should have! Across the street was something else I had never noticed before. 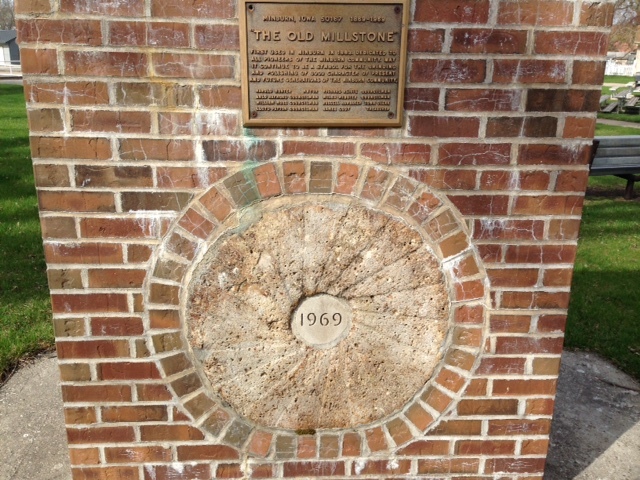 Encased in brick is an millstone used in Minburn back in 1883. Now it's a symbol for building good character. How cool! The ride back to Waukee was uneventful other than seeing a cat hiding in the brush along the trail. I stopped to chat, but it just stared back. Approaching Waukee I picked up biking litter to to later dispose of at the trailhead. I don't understand those who obviously had room in their jersey or bag for a used tube or gel pouch but chose to liter instead.